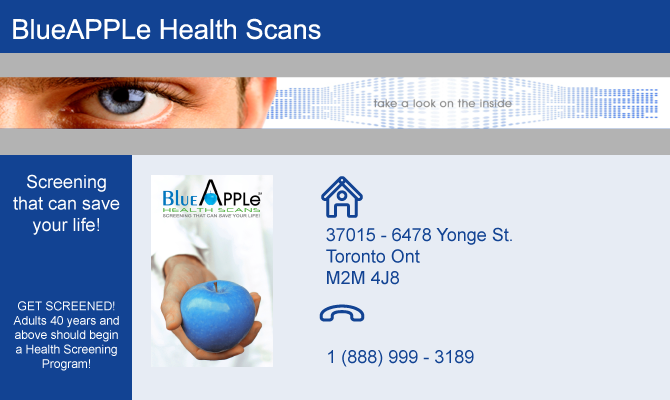 BlueAPPLe Health Scans is the leading health screening provider committed to bringing state-of-the-art diagnostic testing to individuals and corporations in the U.S..
Our mission is to help people live healthier and longer lives. Comfort, knowledge and peace of mind is at the forefront of our company. We are committed to the highest standards of integrity in contributing to the wellbeing of our patients and communities. BlueAPPLe excels at providing screening solutions designed to discover potentially devastating conditions before they have a chance to cause a major illness or morbidity. Our broad range testing portfolio includes: vascular screening for heart disease, stroke, peripheral arterial disease, abdominal aortic aneurysm, carotid artery disease, diabetes, high blood pressure and osteoporosis. Comprehensive blood screening tests include cholesterol (complete lipid profile) and a myriad of blood screens for major diseases. BlueAPPLe’s dedicated team utilizes their unique abilities to ensure delivery of the highest quality service. All of our tests are performed by highly trained technicians with years of clinical experience and read by our own board certified cardiologists and radiologists. What you do today may give you more tomorrows! BlueAPPLe today keeps the doctor away!